Hallmark’s murder mysteries aren’t exactly edge of the seat affairs, but they can yield surprises, especially when you’re drugged up on allergy medicine and half watching alone in your dark studio flat at two in the morning. If I had been paying more attention, I wouldn’t have been as scared by the reveal, which I’m embarrassed to say was enough to rouse me from my drug induced stupor. To be sure, Murder with Love is not an intense whodunit. It even drags a bit since there are only two suspects to question, neither of whom seem like strong candidates for murderer. But this new series, based on books by TV personality Nancy Grace, has more emotional depth than I expected, and I finished the first movie with high hopes for the next few entries. Kellie Martin stars as an assistant DA turned therapist, Hailey Dean, though in my 1994 mind, she is still Appalachian schoolteacher Christy Huddleston. Speaking of, a reboot would be right up Hallmark’s alley. Anyway, Martin plays another strong minded woman, this time in modern dress. Though Hailey’s abandoned law, she’s found a calling in couples therapy, something she’s damn good at because she keeps telling people this. Her reasons for a career change are varied, but she still has a mind for criminal law. When her friend’s mother drowns after overdosing, she uses her experience and connections to help solve the case. Things get real bad real quick for Amanda Stone (Cindy Busby) and her brother, Aaron (Jesse Moss). Just days after their mother dies, their father, a trucking magnate, is found vaporized in his car having taken a fiery, suicidal dive off a bridge. Suddenly the grieving siblings look more like greedy killers, except Hailey is pretty sure her friends aren’t murderers. Well, if that’s the case, why did Amanda use her mother’s hospital ID to order drugs? What happened to the $8 million missing from their father’s trucking business? These inconsistencies are dealt with pretty quickly, and with no other suspects, the investigation stalls. That’s when Hailey’s personal life comes to the fore. Of Hallmark’s many sleuths, she is one of the more interesting ones. Thanks to her job as a therapist, she gets to talk about her own troubles and encourages others to reveal more than dull pleasantries. We find out that her fiancé was murdered during a mugging. That tragedy connects her to hot new coroner, Jonas (Matthew MacCaull), who is recovering from his wife’s death from breast cancer. It also helps a witness open up not just about what she saw but also about her own experience with a violent and random death in her family. I was unexpectedly moved by this scene, which wasn’t in service of anything except life and the emotions that come with it. 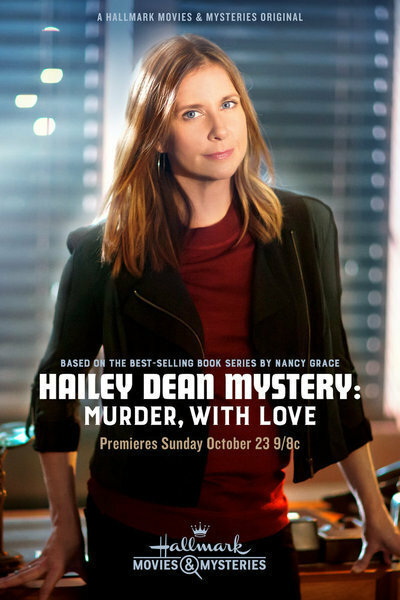 It’s a missing ingredient in many Hallmark movies, so I hope they remember to add it to the next Hailey Dean mysteries. Highlight for spoilers: Daaaaaamn, it was the dad!!! He wasn’t vaporized after all. Turns out Dad was using his truck business to ferry drugs between the U.S. and Mexico. His wife overhears and has to start taking sleeping pills to deal with her criminal husband. Knowing that the DEA is closing in on him, Dad decides to just kill his wife and make off to Brazil, but not before framing an employee by trading identities and killing him in the burning car. Posted in USA, Western TV reviews and tagged Hallmark Channel, mystery films, TV movie on April 23, 2018 by limmer13.